UPDATE: STATEMENT – Giuliani says Trump team responded to Mueller about interview, should be over by Sept 1st! 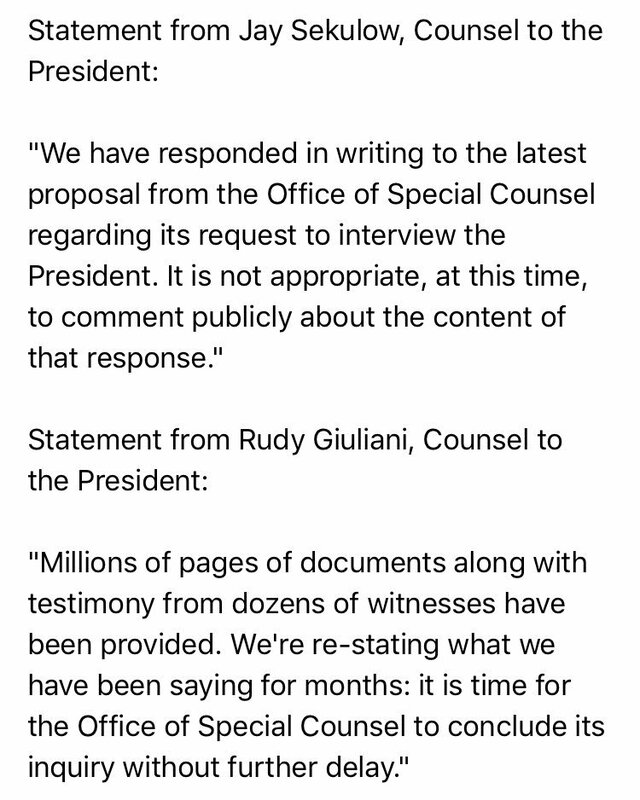 Breaking: Rudy Giuliani says Trump's legal team has responded to Mueller for an interview. "We have now given him an answer... We do not want to run into the November elections. So back up from that, this should be over by September 1st." Sekulow, with Giuliani literally on the phone with him: "I think [the Mueller probe] will end soon. I never give dates. Some of my colleagues give dates." Giuliani, minutes later, says the probe should be finished by Sept. 1. According to ABC News, Giuliani did say doing the interview was Trump’s decision.